Welcome to day 3 of the Waltzingmouse Stamps May release previews. Today we're reviewing both new stamp sets being released - USA 1776 and Country Labels No.4. I was aiming for a quilt effect card using the star shape elements from USA 1776, stamped in a mix of colors to create the look of a quilt. My crafty friend Lin inspired me to use the houndstooth embossing folder over my stamped panel to give the dimpled look of a real quilt. 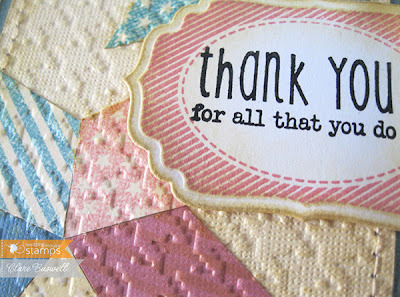 I used another of the fabulous labels from Country Labels No.4 and the sentiment is from the same stamp set. All the cardstock I used is from the Tim Holtz Kraft-Core Nostalgic Collection from Core'dinations. I'll be back tomorrow with the entire Waltzingmouse Stamps design team to showcase these brilliant new stamp sets for the release day blog waltz!! In the meantime check out what my fellow teammates created to inspire you today. 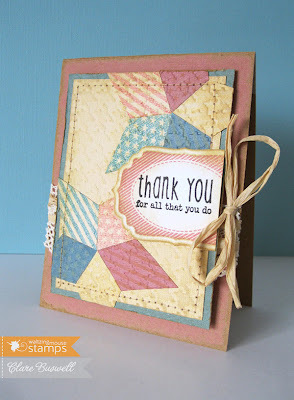 Love the homspun quilt look here Clare, fab card! 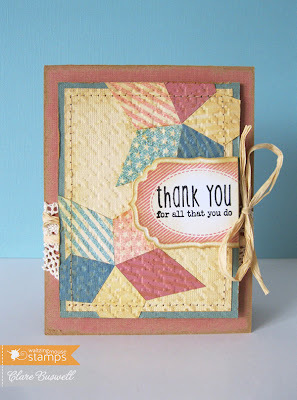 Simply gorgeous Clare, I love the patchwork quilted look! Love the quilt effect and such a sweet sentiment. Fantastic card - I love your technique for making the quilt look so real. Great job! 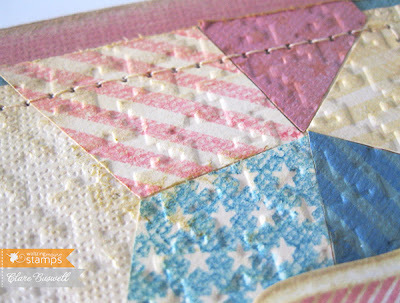 Love the quilted look of the star! Great idea! So charming Clare!! 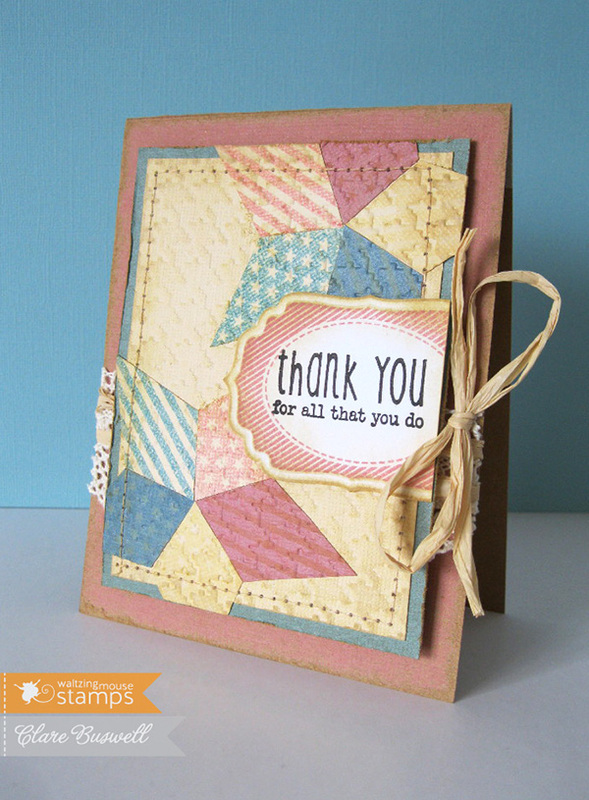 LOVE the quilt feel to this card! Clare, at first glance you'd be forgiven for thinking you had used fabric on the card. Love your quilting. 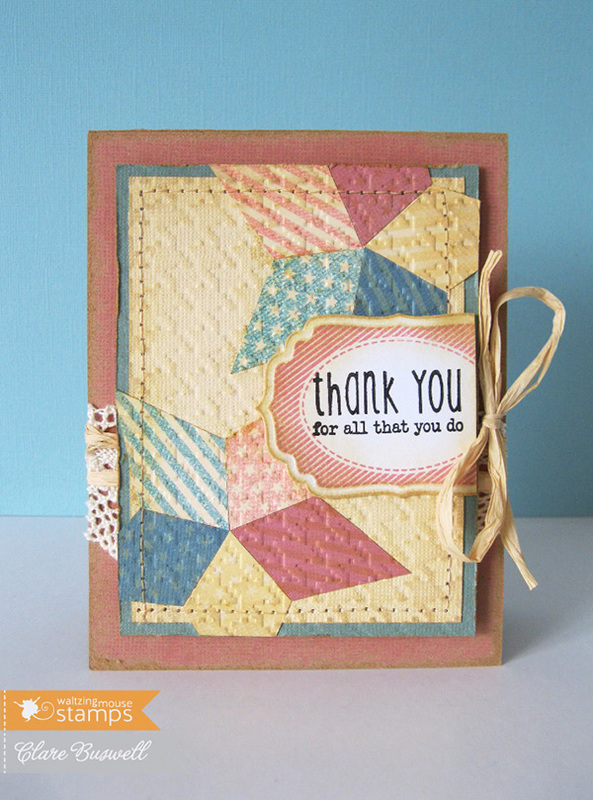 Love the quilting look you achieved in this card. You actually pieced the parts together like a real quilt. The stitching reinforced the look. Great job. I love it. Love the dimpled quilt effect. Also love the colors you chose.